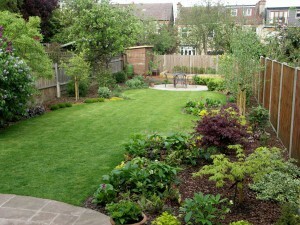 Curved lawns and borders create interest in a rectangular plot. 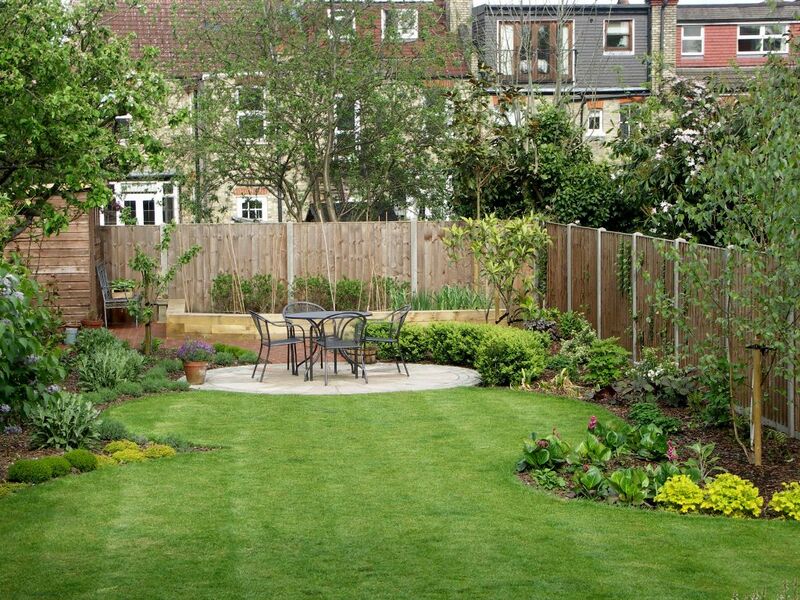 Using circles in gardens can add a feeling of width and interest to a rectangular plot. In this garden in Finchley, North London, we have three main circular shapes – two in grass lawn and one in a circular patio. 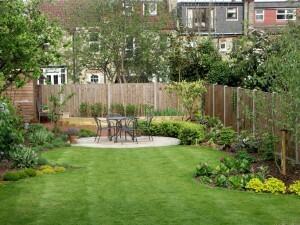 The circles create wider planting beds and different aspects for a range of plants. Planting was finished in October 2014. At the beginning of May 2015, the white birches and small acers are in leaf and the garden is maturing nicely. 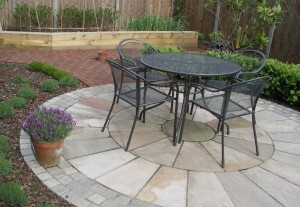 A simple sandstone circle is set off with an outer circle of sandstone setts. 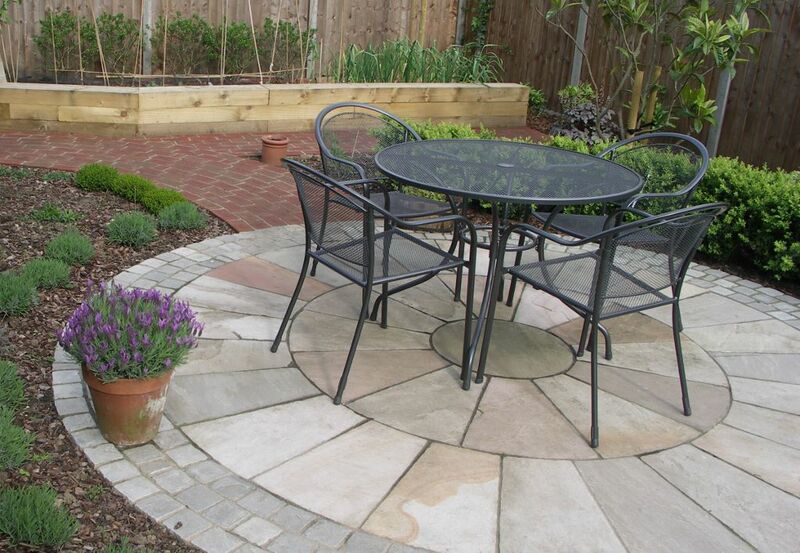 The curved path in clay pavers goes to the shed and continues the circle motif. The wooden sleepers edge a raised bed for vegetables, already full of young produce, and provides useful informal seating. 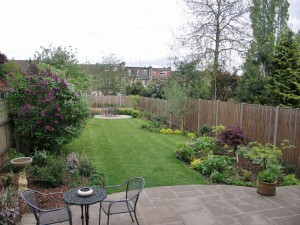 This picture shows the curved beds beside the patio with lavender and box hedging. The loquat is flourishing and the fruit trees have blossomed already. In the summer, a mix of taller flowering shrubs and perennials, will add more colour to make this a delightful place to sit in the sun. 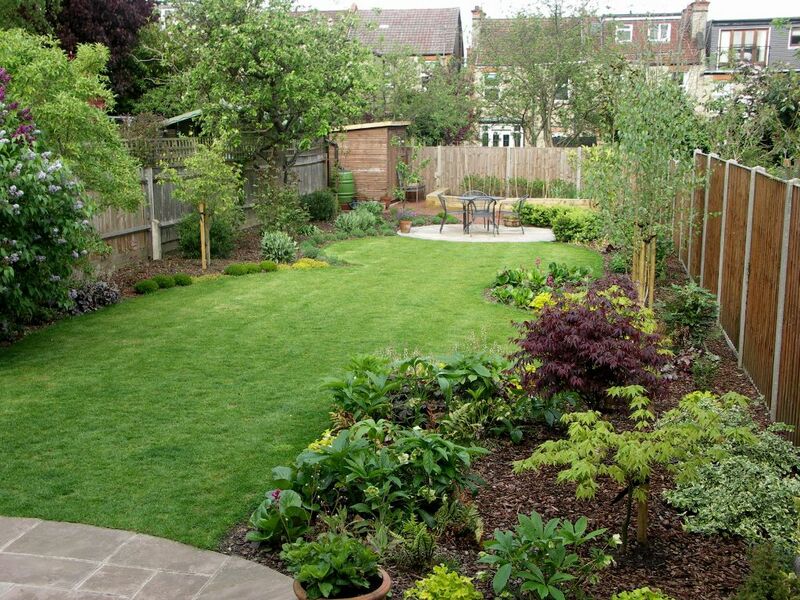 Curved lawns invite a journey down the beautifully planted garden. The small circular lawn joins the patio and the lavender hedge links them both. The larger lawn is part of a larger circle. It creates a broad sweep and has two large curved plant borders within it. The circular patio also reflects the curve of the existing patio by the house. Planting towards the front of the two curved borders includes bergenia, foxgloves, ferns, hellebores and heuchera. At the back are shrubs with two white multi-stemmed birch trees in one and three colourful acers in the other. This entry was posted in Circles in Gardens and tagged acers, Circles in gardens, circular lawn, circular patio, curved brick path, Finchley, Garden Design, Leaf & Acre, North London, Planting Design, white birches on October 8, 2014 by admin.